This is the last of the squishy Kinder things that I found in the fridge at my local Polish grocery store. I've heard reports that you can also find them in more regular shops since, so I'm persevering to complete the range. This bar is slightly larger than a UK Penguin, and more like a small version of the ice-cream Feast. The hazelnuts on the outside are the main difference from the previous bars as this has the whipped white chocolate inside which tastes so good when refrigerated. The inner layer of gooey chocolate is only really noticeable in flavour if you deliberately try just that - the nuts and outer choc overpower it easily. 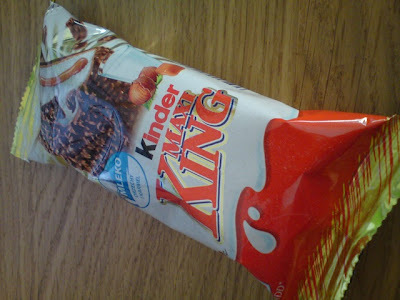 I do think that kinder are missing a trick by not pushing these out to the mainstream supermarkets. They are not that English in their taste or appearance, but in a country where it is far too infrequently cold enough to fully enjoy an actual ice-cream, a chilled choc-cream range (with suitable adverts showing their refreshing nature) may be a winner. As it stands I'll probably pick up a few each time I'm in there - presuming I remember to look in the chilled section for snacks! I'll hunt that out for extra snacking. I agree - they are a light bite indeed!